Most people know the story of the Titanic and the Iceberg. 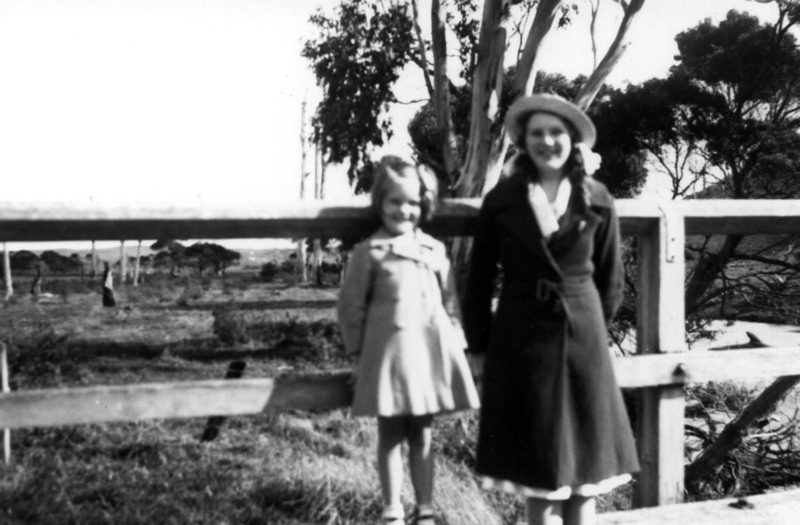 This week Sepia Saturday gave us a photo pf two young orphans who survived the disaster. These are my father’s two younger brothers, Alan and Albert Edward Fricke of Apollo Bay, being photographed in 1920. At the time this photo was taken my father, their older brother, was 16 years old and was only home on the farm at weekends, the weekdays spent boarding in Colac while he attended High School. Alan was just six and a half months old which would place this photo as early August in 1920. Bertie of the golden locks was 2 years and 5 months old. They talk about people wearing their best bib and tucker. It looks as though Alan is actually wearing his best “bib” for the photo.. The photographer was Mendelssohn so the photo was possibly taken on a trip to Melbourne. For other interpretations of the Titanic orphans go to Sepia Saturday. 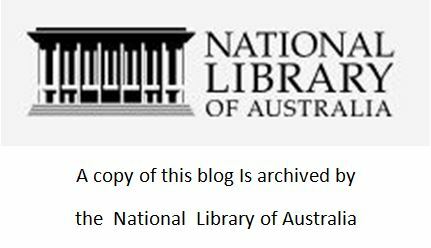 This entry was posted in Family History, Family Stories, Genealogy, Uncategorized and tagged 1920, Apollo Bay, diphtheria, Fricke on January 16, 2016 by lazycoffees. It’s long been known the brothers Peter and George Telford came to Victoria from Roxburghshre. Peter married and had many descendants, includding myself, unlke George who remained single. What little was seen of George was always in the vicinity of Peter and he died in Apollo Bay where Peter lived. He had so little in the way of assets but his relatives were scrabbling to get their hands on it . And so a Trove search on George and his executor led me on to a different search. and another branch of the family. The first surprise came in George’s will where his main beneficiary was his sister Janet Forsyth of Bankhead, Hamilton. I knew he had an older sister Janet who I thought was safely tucked up in Scotland. I had never found any evidence to show she came out to Australia. The second surprise came when I found that the executor, William Steedman Greig, was Janet’s son-in-law, married to her daughter Jane. William was formerly of Bank Head but by then a storekeeper at Macarthur. I’m thinking that Bankhead was the name of a farm, particularly as that was the name of a farm in Linton near Kelso in Roxburghshire, an area with which both Janet and John had connecions. Janet’s husband John Forsyth had died in 1875 and left her with a comfortable sum . Janet was the executor of his will and her brother George made a statement to the effect that he was not a beneficiary of the will but having lived in the Western District for many years he could testify to the value of the property. All of this seems to suggest that George was well known to Janet and her family and had not been his brother Peter’s shadow for all his life in Australia.. It suggests that George was familiar with Hamilton and I wonder if he lived there for some of the time, rather than just visiting. Thanks to Trove leading me to one small newspaper article I was able to expand the picture of our C19th immigrant Telford family from Scotland. This entry was posted in Apollo Bay, Family History, Uncategorized and tagged Apollo Bay, Bankhead, Forsyth, Greig, Hamilton, Telford on January 12, 2016 by lazycoffees. This week Sepia Saturday suggested bridges as our theme and my header above shows the bridge over the Barham River just as it flows into the ocean on the outskirts of the township of Apollo Bay in south-western Victoria. 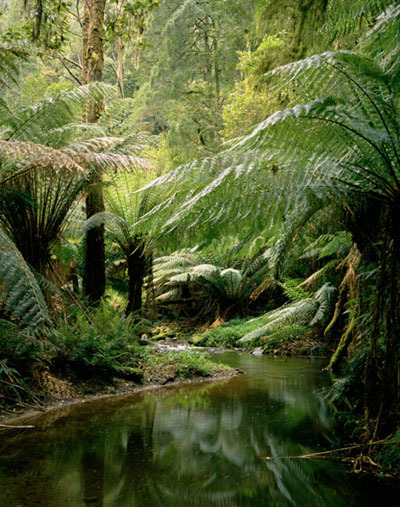 The Barham River rises in the Otway Ranges 16 km , i.e. less than 10 miles away from Apollo Bay. After coming down through narrow valleys it begins to widen as it passes through farmland then meanders through a flood plain before flowing into the sea. But this final crossing of the river is not one that we would normally use, instead we would head west from the town along the Barham River Road, skirt the flood plain and follow the road between farms. 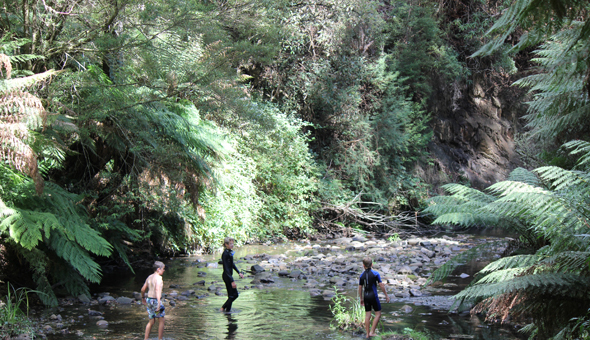 A short distance out of town you come to the first river crossing. The road continues between farming land until it passes between what used to be the Fricke and Garrett farms and comes to a second bridge. 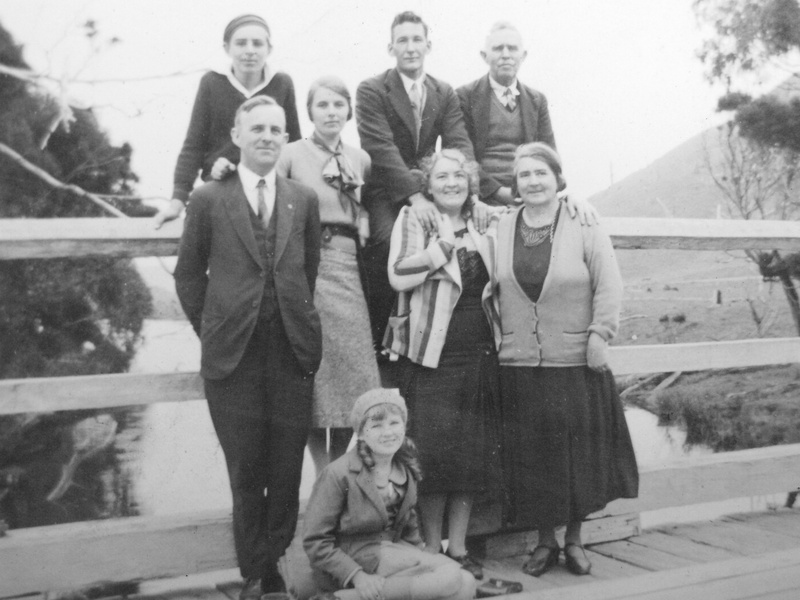 This photo on one of the local bridges was taken in the early 1930s. Counting the photographer, who was possibly Tom’s wife Enid, there are nine people so they wouldn’t have all fitted in the family car, an Essex of about the 1930 vintage. Entertainment was strictly of the home-made kind and a daytime walk was sometimes taken across this second Barham River bridge, following the road further upstream into the valley. In this Google Earth photo you can see the right hand road following the stream. Though the hills are cleared a narrow strip of bush remains along the river bank. After crossing this second bridge a little further up the road is an area along the river called Paradise, and on a hot day in summer this gully really is Paradise – a cool paradise of lush tree ferns and other local trees and plants , lichens and mosses, and home to a variety of birds. It is a magical place. With its special aroma and the music of the water over the pebbles every leaf has the potential to have a fairy peeping out from underneath. When you leave the road and walk along the river you can cross over on fallen trees or on stepping stones in shallow parts of the narrow river. . The bottom is pebbled and the water is fresh and clear. this week’s Sepia Saturday contributions. This entry was posted in Apollo Bay, Family Stories, Uncategorized and tagged Apollo Bay, Barham River, bridge, Fricke, Paradise on September 5, 2015 by lazycoffees. The image for Sepia Saturday this week with its long dresses could be interpreted as dance time, dance time when dancing was dancing and not jiggity jig, hoppity hop. 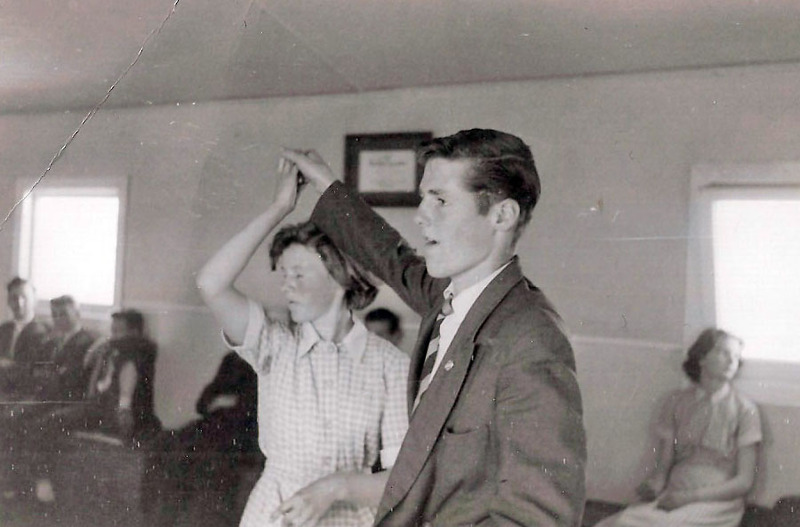 And so learning to dance properly was de rigueur. 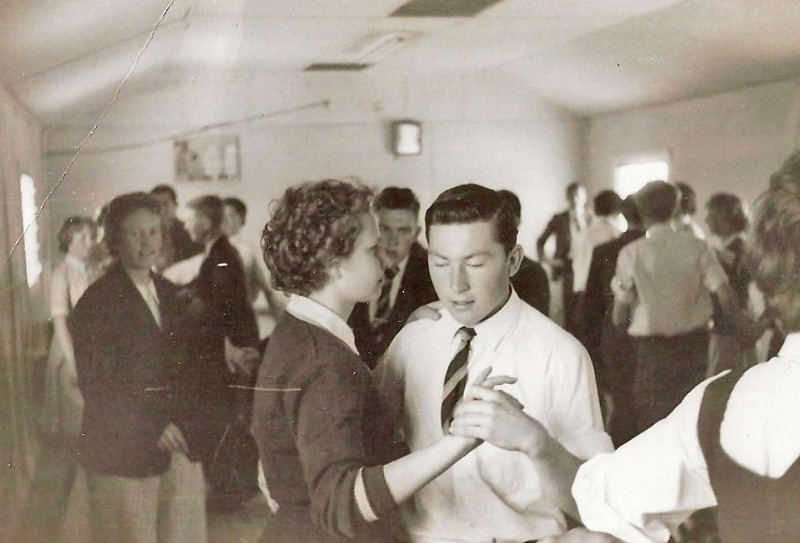 Circa 1960 at Sunshine High School in the Melbourne suburbs students devoted one period a week to a club of their choice. 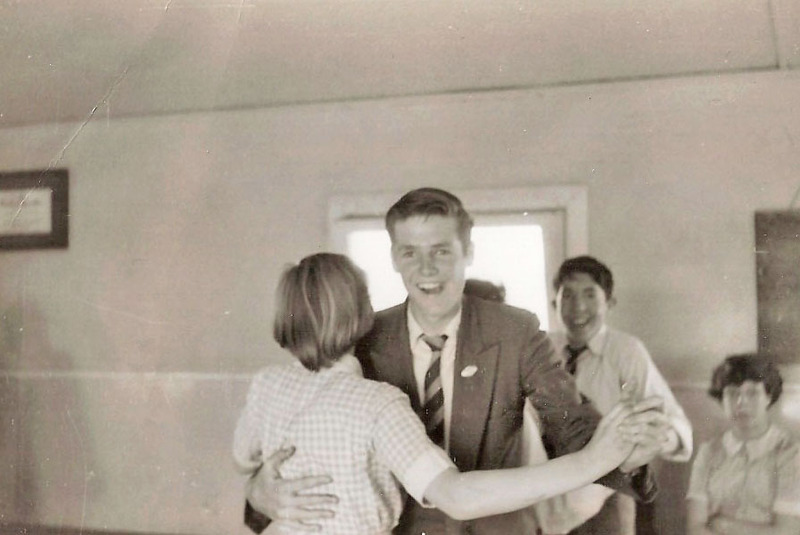 These photos are from the Dancing Club. Ballroom dancing, of course. 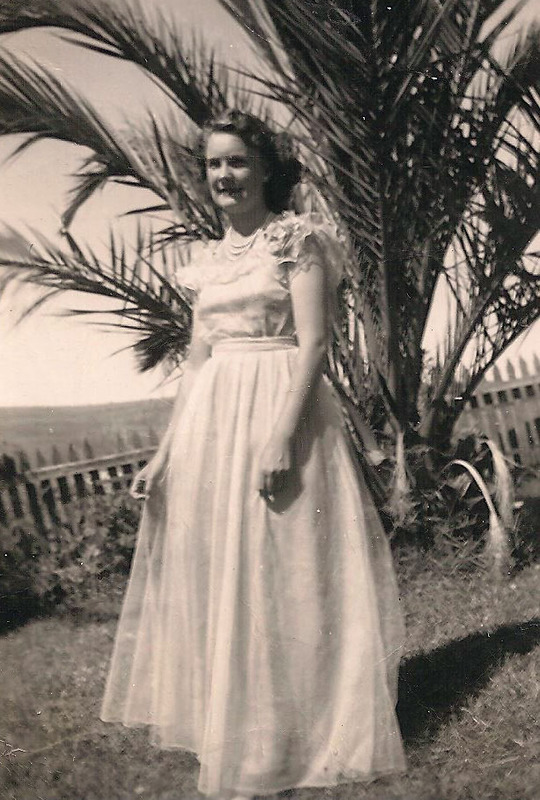 And a girl eventually got her first long dance dress, this time Christmas holidays at Apollo Bay in 1946/7 – layers of blue and pink tulle with a corsage on the shoulder of blue and pink plastic flowers. And more interpretations of Sepia Saturday’s image can be found listed on Sepia Saturday. This entry was posted in Apollo Bay, school and tagged Apollo Bay, ballroom, club, dance, dancing, dress, Sunshine High School, tulle on May 24, 2015 by lazycoffees. It is interesting how various kinds of Sports Clubs were formed in the small country towns around Australia. Apollo Bay on the south west coast of Victoria was no exception and the men of the Telford family were participants, both on and off the field. The newspaper at the larger regional town of Colac reported news from all the surrounding small towns and so we know that at various times the Telford brothers George , Robert , William, Norman and either Abner Albert or Arthur Alfred all appeared as members of the Apollo Bay cricket team before the First World War. Only initials, not Christian names, were used in the reporting, hence the confusion with the “A”. I think this photo of the Apollo Bay cricket team could have been taken between 1900 and 1910. Which of the Telford brothers were playing that day ? Here are four of the Telford men. Time to play pin the tail on the donkey or match the faces. I come up with a different solution every time I look at it but there are definitely some Telford faces in the cricket team. I wish you luck. Missing are photos of the two oldest, George b1869 and Robert b 1872. It’s interesting to see how the men tended to wear their hats pushed back on their heads. And some of them playing cricket in a collar and tie. 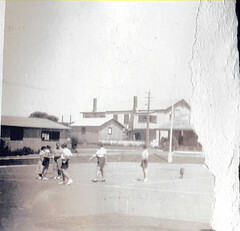 Matches were played against other communities. Some of these were inland but contests with Lorne involved a boat trip around the coast. Often the Rifle Club had a contest on the same day. 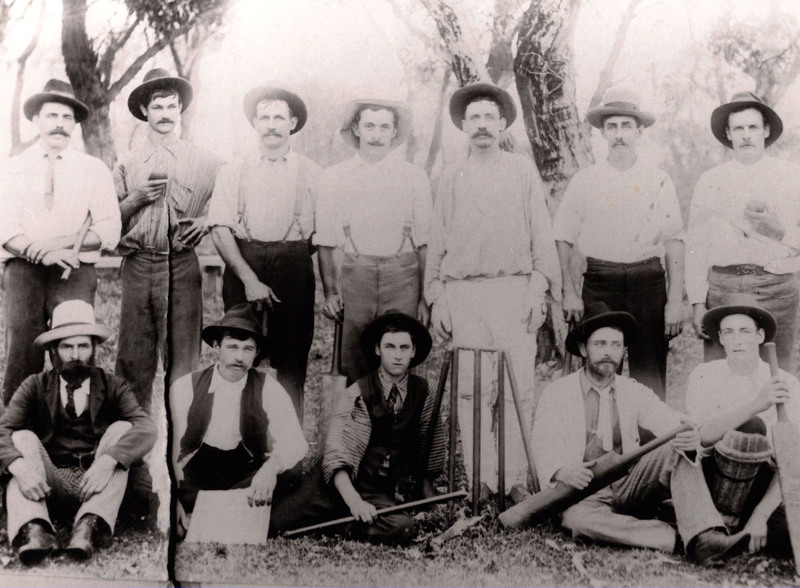 The Albert Park cricket team came down from Melbourne for a match on Christmas Day 1901. Away from home on Christmas Day ? That sounds a bit strange. They came down on the SS Dorset, which involves a trip down Port Philip Bay then through the Heads and out into the open ocean. And then there was the local Athletics Club. In the 1908 AA Telford (which AA? – Abner at 34 or Arthur at 25) travelled to Stawell to compete in a larger annual Athletics Championships – who doesn’t know the Stawell Gift – and was placed 2nd in one of the heats of the 130 yd Hurdle Race. 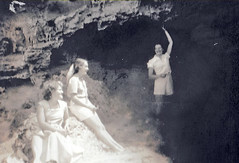 But the ladies are not completely forgotten and their clothes are always of interest. 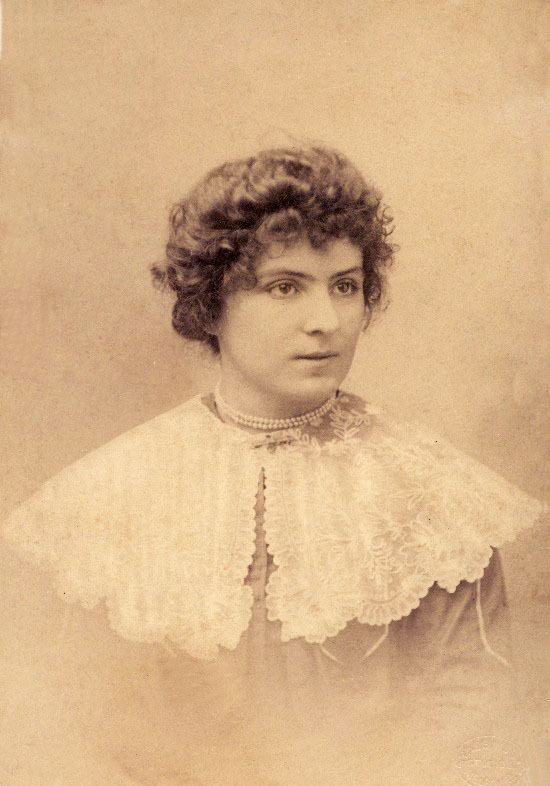 At the Ball which followed the Annual Sports Day at Apollo Bay in 1898 it was reported that my 11 year grandmother Julia, niece of all these Telford sportsmen, wore fawn, with trimmings while her slightly older sister wore shot lustre and her mother black with jet trimmings. I’m sure there must have been a pecking order in that newspaper list of guests at the Ball. They definitely weren’t in alphabetical order and the list, as always, was supplied by a local correspondent. People sometimes comment that I seem to have a large collection of old family photos. I should point out that I don’t own the original of all of them. 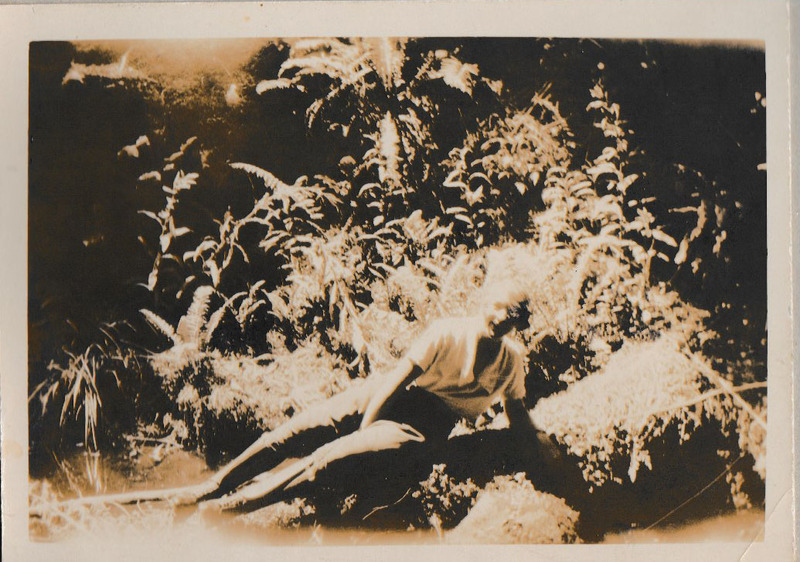 But I have collected copies of photos from family members for a long while. At first someone photographed them for me, then the scanners came along. My first scanner was a small hand held roller which you had to roll steadily over a snapshot. Then came the better quality scanners. 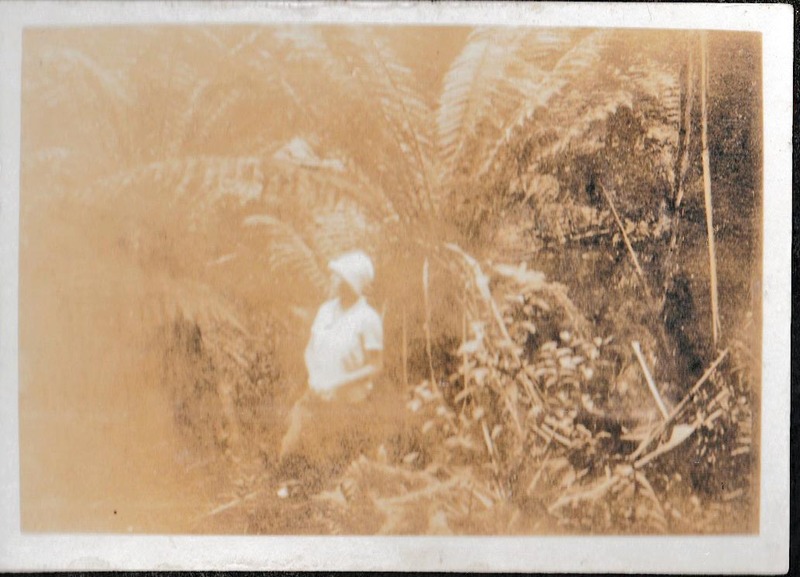 Many of the owners of the photos didn’t want it known who had these family treasures. I am very grateful to those people who let me copy their photos and in some cases actually gave me the original as at the time it was of an unknown person. So what you see are my family scans of which I own quite a few of the originals but not all. Some of the original group photos have already been donated to the State Library to make sure they will always be shared.b They are online for all to see. 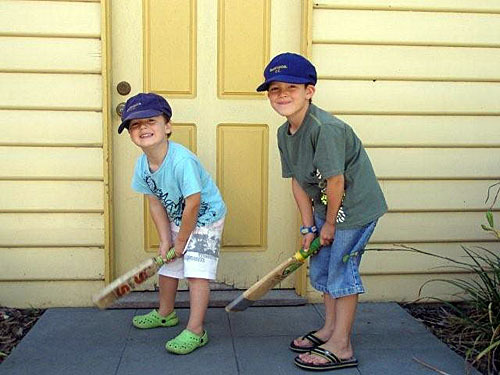 This entry was posted in Apollo Bay, Family History, Family Stories, Sport, Uncategorized and tagged Apollo Bay, cricket, ss dorset, team, Telford on May 3, 2015 by lazycoffees. When I saw the theme photo for this week’s Sepia Saturday, the first thing I noticed were the converging lines . So though the theme photo is one of linesmen working on a power supply I want to show you a boat by the pier at Apollo Bay on the south west coast of Victoria in 1908 with similar converging lines. The Centurion was owned by the Apollo Bay Fishing Company and my grandmother’s uncle, Peter Telford Jr (1867-1953), was one of the Directors. I can’t tell you which of my relations let me scan this photo but the details on my computer show that I added the image in 1998 but it’s only now that I realize its significance to the family story. Apart from a road/track which connected Apollo Bay to the railway line at Forrest, the sea was the the other method of transport until the Great Ocean Road was built. Logging, fishing and dairy farms flourished and onions and potatoes grew well in the area. 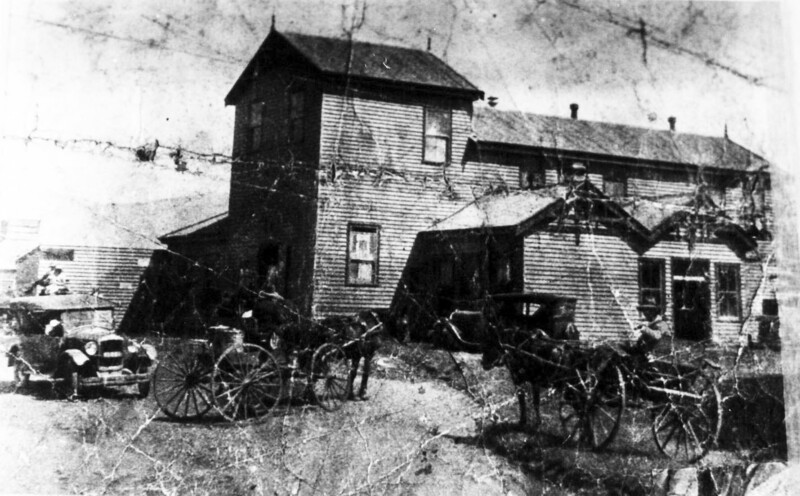 A butter factory had been built in 1904 and there was a weekly boat carrying cargo to Melbourne. The refrigeration at the butter factory was by Humble & Sons of Geelong. This interests me as the world’s first practical refrigerator was made here in Geelong in 1856 by James Harrison. When the locals became dissatisfied with the shipping service they were receiving in 1908 they decided to set up a Co-operative known as the Apollo Bay Shipping Company and buy a boat of their own.The company was limited to 2000 shares, 2/6 (two shillings and six pence) payable on application, 2/6 on allotment, and 2/6 monthly calls., Peter Telford was one of the seven Directors. On August 10th, 1908, The Colac Herald reported that the Company’s boat, the Centurion, buillt in Sydney, had just made it’s first run to Apollo Bay. The new boat of the Apollo Bay Shipping Company Limited made its first trip to Apollo Bay this week under adverse weather conditions. Strong easterly weather has been prevailing for a week, and as no wind turns Apollo Bay into such raging, wild, angry sea as the east, the sea for days has been very rough. The Centurion left Melbourne on Tuesday night, and travelled to the Heads with her engines in 4 1/2 hours, arriving in the Bay on Wednesday morning. She took several circles around the Bay doubtful of the wisdom of mooring at the jetty with such a heavy sea. 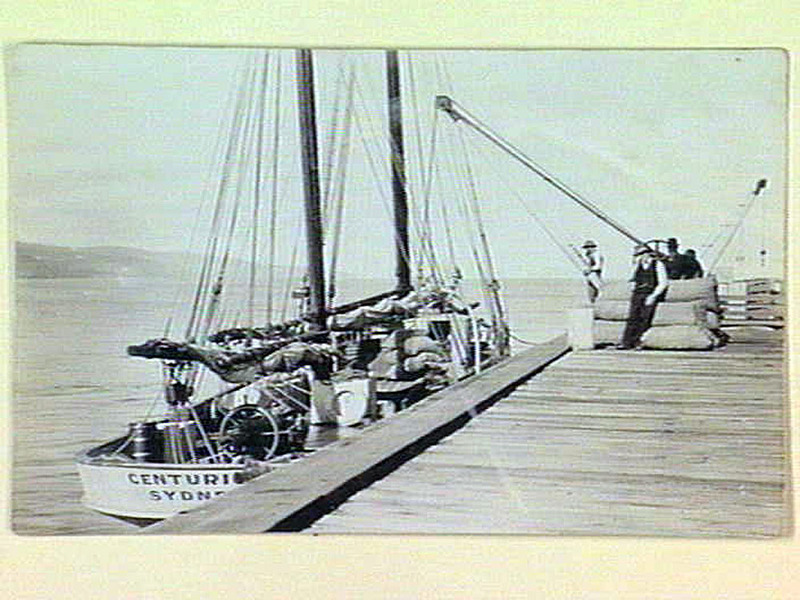 Every man, woman and child at liberty in Apollo Bay assembled on the jetty as she came alongside, discharged part of her cargo, and took in a few onions. As the sea was rising, and threatening worse to follow, Captain Jeffery cast off, and went round Cape Otway for shelter. The Centurion is a new boat, a year old. She is exceptionally well built, and is claimed by experts to be the best built boat of her class in Victorian waters. Her speed under auxiliary power only is 7 to 8 knots, while with a favorable wind under sail that speed would be greatly increased. The Centurion is built for strength, speed and safety, having an exceptional beam of 20 feet, with length of 80 feet……….. In November the regular weekly service was doing well in what was usually a slack time of the year. 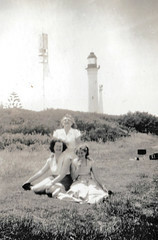 At the same time the small community, though the activities of The Apollo Bay Medical Club, acquired the services of a lady doctor, Dr Maud Campbell. She stayed until 1912 when she tootled off to Toorak (in Melbourne) to become Mrs John E. Ashley, then live in Ballarat. So what went wrong ? Why was it necessary to find a buyer of the Centurion ? In August 1912 the ketch Centurion became the property of the Apollo Bay and Port Campbell Shipping Company, Then a few months later it was sold once again. 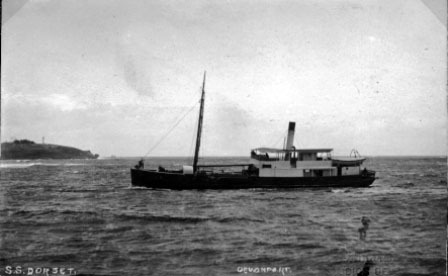 Finally the Centurion caught fire off Phillip Island while returning to Melbourne with a cargo of lime and was beached and wrecked in July 1913. I’m sure that couldn’t be a front loading washing machine stored on deck, but it is an intriguing shape. More diverging lines, power lines and lots of goodies to be seen through the links on this week’s Sepia Saturdays’ page. This entry was posted in Apollo Bay, Family History, Shipwreck, Uncategorized and tagged Apollo Bay, butter factory, Centurion, jetty, ketch, shipping company, Telford on April 18, 2015 by lazycoffees.